Increasingly, health professionals recommend that people of all ages protect their eyes from excessive blue-violet light exposure. 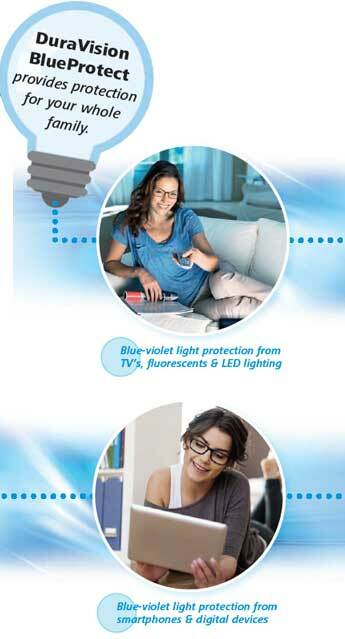 Your eye doctors at Martin Street Optometry offer the latest in blue protect lens coating and technology. ZEISS DuraVision BlueProtect incorporates leading edge anti-reflective and scratch-resistance technology ensuring both your eyes and eyeglasses are protected. Surface reflections from lenses can distract you and interfere with your vision, particularly in lowlight conditions like night driving. Anti-reflective lenses reduce reflections, resulting in clearer vision. Superior scratch-resistance technology helps protect lenses from developing scratches due to cleaning and normal wear and tear. Make an appointment today at our Milton eye care center and find out more about why ZEISS DuraVision BlueProtect is the preferred choice for blue screen protection.